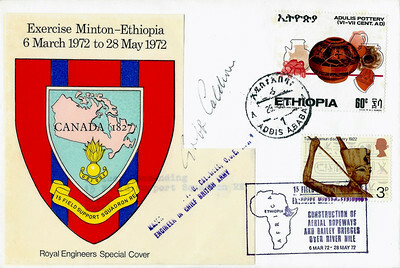 Exercise Minton-Ethiopia - 6 March 1972 to 28 May 1972 Commemorative Cover Cachet: Outline map of Africa showing Ethiopia, 15 Field Support Squadron RE, Exercise Minton - Ethiopia, Construction of Aerial Ropeways and Bailey Bridges over River Nile, 6 Mar 72 - 30 May 72.Stamps: 60c "Decorated Pottery Adulis", Ethiopia commemorative stamp: 3ᵖ "Tutankhamen Discovery 1922" commemorative, issued 26 April 1972 and signed by Engineer in Chief. Circular Date Stamp: 29.5.72 ADDIS ABABA 1. 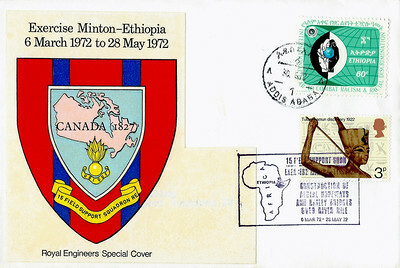 Exercise Minton-Ethiopia - 6 March 1972 to 28 May 1972 Commemorative Cover Stamps: 60c "To Combat Racism & Racial Discrimination", Ethiopia commemorative, issued 31 August 1971: 3ᵖ "Tutankhamen Discovery 1922" commemorative, issued 26 April 1972. Cachet: Outline map of Africa showing Ethiopia, 15 Field Support Squadron RE, Exercise Minton - Ethiopia, Construction of Aerial Ropeways and Bailey Bridges over River Nile, 6 Mar 72 - 30 May 72. Circular Date Stamp: 30.5.72 ADDIS ABABA 1. RSME Open day 1972 Commemorative Cover Stamps: 3ᵖ "Tutankhamen discovery 1922" commemorative, issued 26 April 1972. Cachet: Badge of the Eagles, The RE Free Fall Parachute Team. 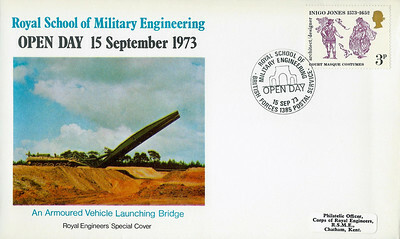 Special Handstamp: Royal School of Military Engineering Open Day, 2 SEP 72, BFPS 1325. RSME Open day 1972 Commemorative Cover Stamps: 3ᵖ "Tutankhamen discovery 1922" commemorative, issued 26 April 1972. Cachet: In Red, Badge of the Eagles, The RE Free Fall Parachute Team. 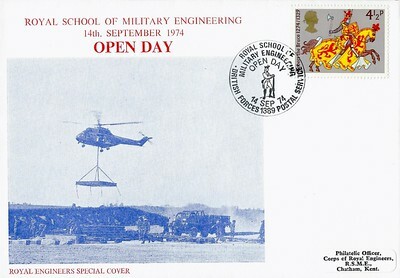 Special Handstamp: Royal School of Military Engineering Open Day, 2 SEP 72, BFPS 1325. Signed by a team member. Trans Atlantic Single Handed Race 1972 Commemorative Cover Stamps: 7½ᵖ "19th Century Coastguard", issued 26 April 1972. Cachet: Lt Col. P.H. ('Jock') Brazier R.E., Official Royal Engineers Yacht Club Entrant, Transatlantic Single Handed Race 1972, Plymouth, UK to Rhode Island, USA. Special Handstamp: Transatlantic Single Handed Race, Return of Royal Engineers Entrant, BFPS 1320. Exercise Makefast XXI Commemorative Cover Stamps: 3ᵖ Machin definitive, ultramarine. Special Handstamp: Exercise Makefast XXI, Hameln, BFPS 1360, silhouette representing the German town of Hameln in the centre. Back of Envelope showing the Emblem of Hameln. Back of Envelope showing the Emblem of Hameln. RSME Open Day 1973 Commemorative Cover Stamps: 3ᵖ "Court Masque Costumes" commemorative, issued 15 August 1973. Special Handstamp: Royal School of Military Engineering Open Day, BFPS 1385, Silhouette of the Russia Memorial Archway in the centre. Presentation of the Freedom of Willich to the Corps of Royal Engineers - 16 October 1973 Commemorative Cover Stamps: 10pf West German definitive, President Gustav Heinemann, issued 23 October 1970: 3½ᵖ Machin definitive, olive-grey. Special Handstamp: Die Freiheit Der Stadt Willich Für Die Royal Engineers, 16 October 1973, RE monogram in the centre. Special Handstamp: Presentation of the Freedom of Willich to Royal Engineers, BFPS 1427, Town Coat of Arms in centre. EXERCISE MIRZA 29 Dec 73 to 2 Apr 74 Commemorative Cover Stamps: 5mms "Palace of the Republic Khartoum Sudan" definitive, 10mms "Folk Art Straw cover", Sudan definitive, issued 1 October 1962. Circular Date Stamp: -2 APR.1974, Khartoum Mails. Cachet: Damaged by Floods during a tropical thunderstorm in Sudan. EXERCISE MIRZA 29 Dec 73 to 2 Apr 74 Commemorative Cover Stamps: 5mms "Palace of the Republic Khartoum Sudan" definitive, 10mms "Folk Art Straw cover", Sudan definitive, issued 1 October 1962. Circular Date Stamp: -2 APR.1974, Khartoum Mails. Signed by: John Phillips CMG. EXERCISE MIRZA 29 Dec 73 to 2 Apr 74 Commemorative Cover Stamps: 5mms "Palace of the Republic Khartoum Sudan" definitive, 10mms "Folk Art Straw cover", Sudan definitive, issued 1 October 1962. Circular Date Stamp: -2 APR.1974, Khartoum Mails. Signed by: OC 32 Fd Sqn. Cachet: Damaged by Floods during a tropical thunderstorm in Sudan. Exercise Occlusion - Malawi 26April - 25 July 1974 - Back. RSME Open Day 1974 Commemorative Cover Stamps: 4½ᵖ "Owain Glydwr" commemorative, issued 10 July 1974. Special Handstamp: Royal School of Military Engineering Open Day, BFPS 1389, figure of a soldier of the Sappers and Miners in the centre. EXERCISE MIRZA 2 Sudan 1975 Commemorative Cover Stamps: 5½ᵖ Machin definitive, violet. Special Handstamp: Exercise Mirza 2 11 Field Sqn RE, BFPS 1395, Squadron badge shown in the centre. Centenary of The Royal Engineers Winning FA Cup 1875-1975 Commemorative Cover Stamps: 5½ᵖ Machin definitive, violet. Special Handstamp: Centenary of Royal Engineers Winning Football Association Cup 1875 - 1975, BFPS 1509, silhouette of the FA Cup in the centre.